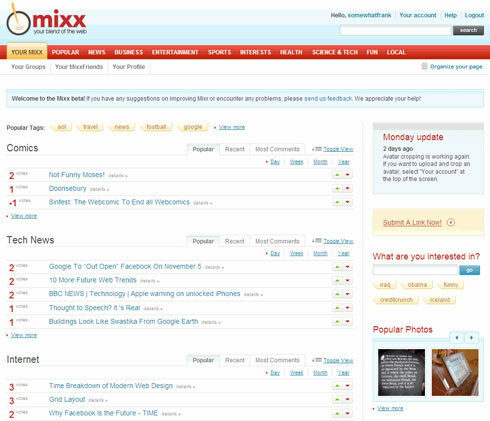 Mixx launched last week to offer up a social news site for the mainstream to explore. Founded by Chris McGill, formerly of Yahoo and USA Today, Mixx aims to offer a place for large publishing companies to get into the social media space. Mixx enables users to contribute and discover stories, video and photos as they blend their own mix of the Web. With two former AOL colleagues on the Mixx team, I got a chance to visit its northern Virginia headquarters a few weeks ago for a private demo of the pre-launched product. My attention was immediately attracted to Mixx's calm color palette and clean design as it offers up the ability for users to contribute and vote on content similar to Digg. Mixx allows users to tag and categorize content so that others can then subscribe to both. Mixx categories mirror those of traditional online news offerings while tags are open to anything a user would like to contribute. Mixx reminds me of a blend of sites. Mixx adds a personalized spin by offering a "My Mixx" page where users can f0llow categories, tags and people t0 aid relevant discovery which reminded me of other personalized startpage products like myAOL. Mixx enables users to connect and follow other users which is similar to how you can follow users on Twitter or StumbleUpon. Mixx also offers up local content from the community by ZIP Code, area similar to Topix but takes it a step further by displaying content of what your neighbors are reading. Mixx has a tough road ahead as there are a number of Digg-like social news products on the market. However, Mixx's strategy appears to cater to large online publishers is a solid distribution strategy - one that Digg might want to consider attacking more aggressively.